I have discussed solvent changes with normal-phase determining a third solvent of different selectivity was needed to separate some terpenoids in a lavender oil. In this work, a gradient using hexane and DCM provided a separation of some of the components while a hexane/ethyl acetate separated other compounds in the oil, Figure 1. 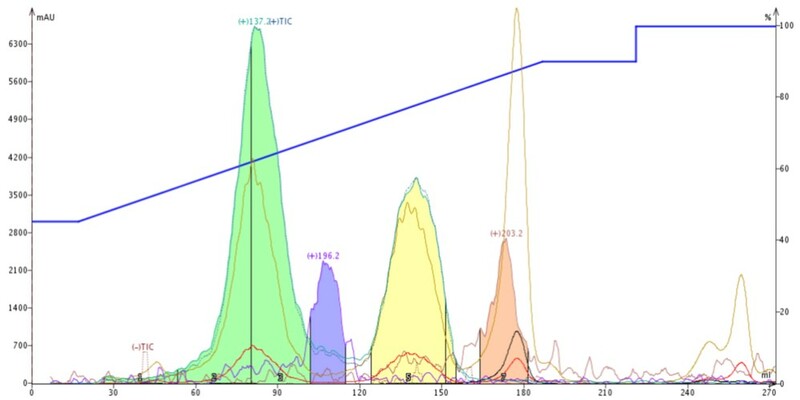 A note of clarity – because these terpenoids either create an adduct with acetonitrile or fragment in the mass detector APCI source, the detected masses are different that the parent MWs. Figure 1. Lavender terpenoids found in sample with both parent MW and detectable m/z. With some experimentation, I determined a gradient using all three solvents, hexane, DCM, and ethyl acetate improved the separation of all components. One option I did not try with the lavender oil, until now, was reversed-phase flash chromatography. With the lavender sample being an organic oil, a mobile phase high in organic solvent (methanol or acetonitrile) ensures that proper partitioning and mass transfer kinetics occur. I started with a 12-gram Biotage® SNAP Ultra C18 column and a linear gradient of 45-90% acetonitrile over 10 CV with mass detection. I found I could separate linalool (+m/z 137.2), 1,8-cineole (+m/z 196.2), and linalyl acetate (+m/z 137.2) from each other but caryophyllene oxide (+m/z 203.2) co-eluted with a strongly UV-active terpene, Figure 2. Figure 2. 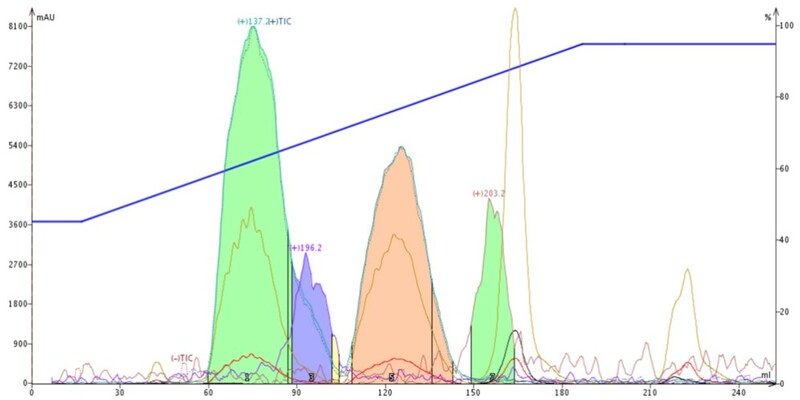 A 45-90% ACN gradient separated 1,8-cineole from linalool (green) and linalyl acetate (yellow) but not caryophyllene oxide (pink) from a hydrophobic terpene. I replaced acetonitrile with methanol and ran a 60-100% gradient over 10 CV. Since methanol is more polar than acetonitrile, a higher methanol concentration is required to maintain the same compound retention. I chose 60% because this percentage has nearly identical solvent strength as 45% acetonitrile. For a full acetonitrile/methanol solvent strength comparison click here. As seen in my normal-phase work, changing a solvent from one selectivity class (VI) to another (II) dramatically modified the separation. 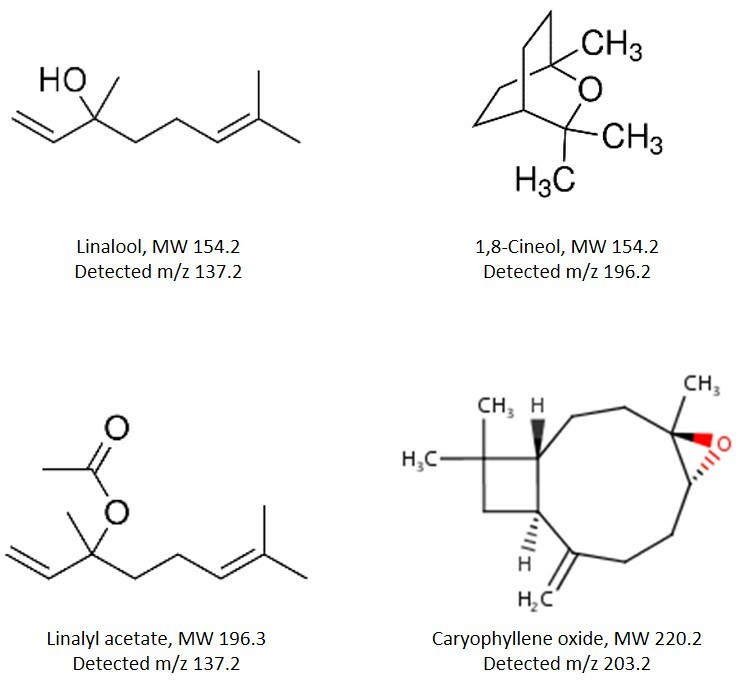 However, although the methanol gradient resolved caryophyllene oxide from the lipophilic terpene, 1,8-cineole now co-elutes with linalool, Figure 3. Deja vu all over again, what is it with these compounds? Figure 3. 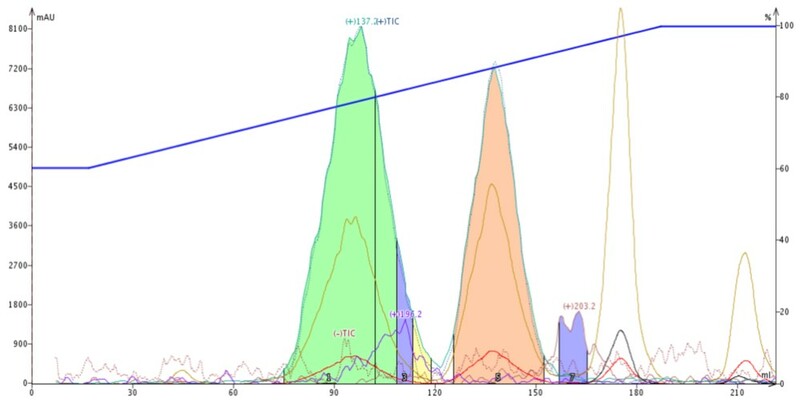 A 60-100% methanol gradient separated caryophyllene oxide second blue peak, +203.2, from linalyl acetate (pink) and a hydrophobic terpene but not 1,8-cineole (+196.2) from linalool (green). So, as with my previous normal-phase work, I tried incorporating both acetonitrile and methanol into the method and found a gradient starting at 45% methanol/55% water and ending at 95% methanol/5% water with acetonitrile dialed in isocratically at 30% provided a separation of all compounds (though not optimized), Figure 4. Figure 4. A gradient blend of ACN + MeOH partially separates all targeted terpenoids from each other and a lipophilic terpene. Yes, I know the solvent percentages do not total 100%. Since acetonitrile is a constant 30%, the Isolera™ Dalton system automatically compensates and proportionally adjusts both methanol and water throughout the gradient. The actual gradient run was 30% acetonitrile/31.5% methanol/38.5% water to 30% acetonitrile/66.5% methanol/3.5% water over 10 CV. So, why does acetonitrile/water separate linalool from 1,8-cineol and methanol/water separate caryophyllene oxide from the hydrophobic terpene? My theory is that acetonitrile, with its available pi electrons, is more selective towards linalool (contains 2 pi electron-rich double bonds) than methanol and that protic methanol has a similar impact (possibly H-bonding) with caryophyllene oxide’s oxygen. 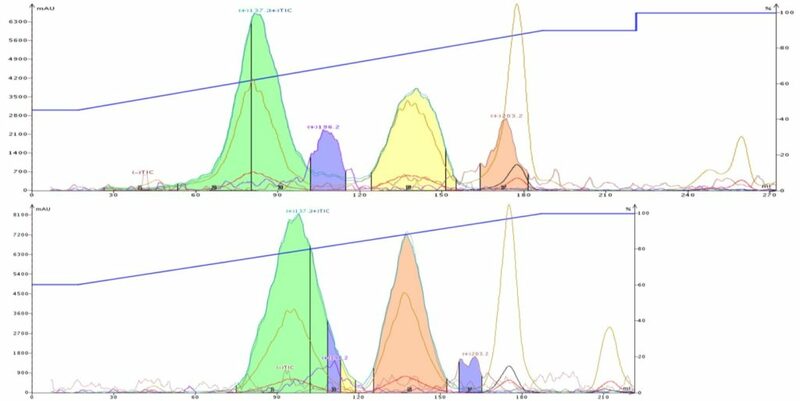 When you compare the chromatography, you see where 1,8-cineole (+m/z 196.2) and linalyl acetate elute at a similar retention volume in both the methanol and acetonitrile gradients (~110 mL and 140 mL, resp.) while linalool is retained further in methanol (~95 mL) than acetonitrile (~80 mL), Figure 5. Likewise, caryophyllene oxide (+m/z 203.2) elutes earlier (~160 mL) when methanol is used compared to when acetonitrile where it elutes at ~175 mL, see Table 1 for a summary. Figure 5. Comparison of ACN (top) and MeOH (bottom) gradients at equivalent strength shows major selectivity differences between solvents. Scales are normalized to simplify the visual comparison. So, if you experience separation problems like what I have labored over in this blog, try modifying mobile phase solvents or column media or perhaps both. Remember, chromatography is applied chemistry so choose your solvents and media to create the desired result. For more information on flash chromatography tips and tricks, click on this link and register. This was a really good read. Thanks for sharing this Luiza.